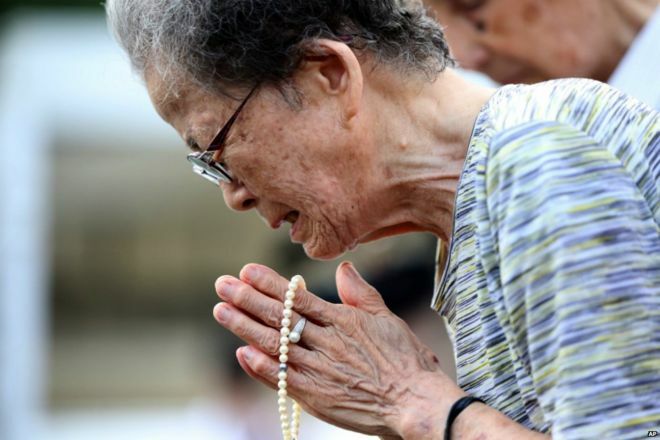 An emotional memorial service has been held in the Japanese city of Nagasaki where US forces dropped an atomic bomb exactly 70 years ago. Dr. Fred Knelman is the Vice President of the Whistler Foundation for a Sustainable Environment, and Joan Russow,from the Ecological Rights Association, was the delegate for the Whistler Foundation at the New York Preparatory Committee for UNCED and at the Earth Summit at Rio. The Whistler Foundation and the Nuclear Age Peace Foundation had circulated a Declaration that was signed by 37 Nobel Laureates; this declaration called for the phasing out of Nuclear energy. They requested permission to read this declaration at one of the plenary session at Rio Centro; permission was denied. The International Atomic Energy Agency (IAEA) was initially set up in the 1960's to regulate Nuclear energy; they have, however, become one of the strongest proponents of nuclear energy. A fundamental regulatory principle of the "separation of function” is that "the agency entrusted for regulating a technology cannot be the same agency that promotes the use of that technology"(Knelman, 1975). IAEA , through its UNCED document entitled "Nuclear Techniques and Sustainable Development." acted as a major proponent, not only of the current use, but of the increased use of nuclear energy. complying with all applicable Federal laws, regulations and policies." A plane so technologically advanced that it would give Britain and the US air superiority in any future conflict and billed as the world’s most advanced stealth fighter jet, could be one of “the biggest white elephants in history”, according to former defence minister. And while costs of the F-35 spiral and delays run into years, another commentator has warned that “our skies and seas are vulnerable”. The aircraft, manufactured by Lockheed Martin, was designed to replace the Harrier jump-jet, which went out of service in 2011. The UK once envisaged ordering 150 F-35s, to be ready by 2012. Three years on, the F-35 is still far from ready to fly in combat and the cost of a single jet has risen from £33m to £87m. The UK has ordered only eight to dhttp://www.independent.co.uk/news/uk/home-news/new-us-fighter-jet-on-course-to-becoming-one-of-historys-biggest-white-elephants-10238761.htmlate.